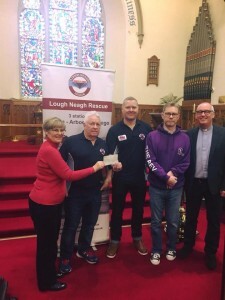 Can we take this opportunity to thank Rev Stephen McBride, Rev Aaron Mcallister and Cynthia Cherry who presented crew members Drew Taggart and Desi Lundy with a cheque for £2000. This money was raised during the Christmas tree festival at All Saints. Can we thank all the members of the church and general public for supporting the event and your continued support in helping to raise this fantastic amount. Can we also thank Mrs Fiona Simpson for her kind donation to our Lifesaving charity. We are truly overwhelmed by everyone’s kindness.